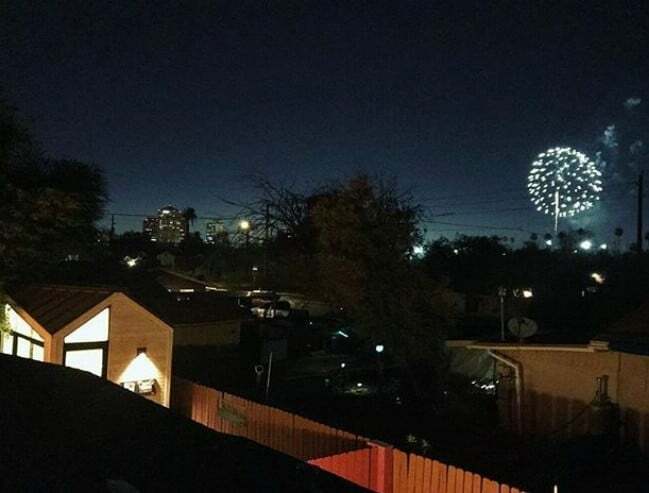 If this house looks familiar to you, it may be a coincidence. 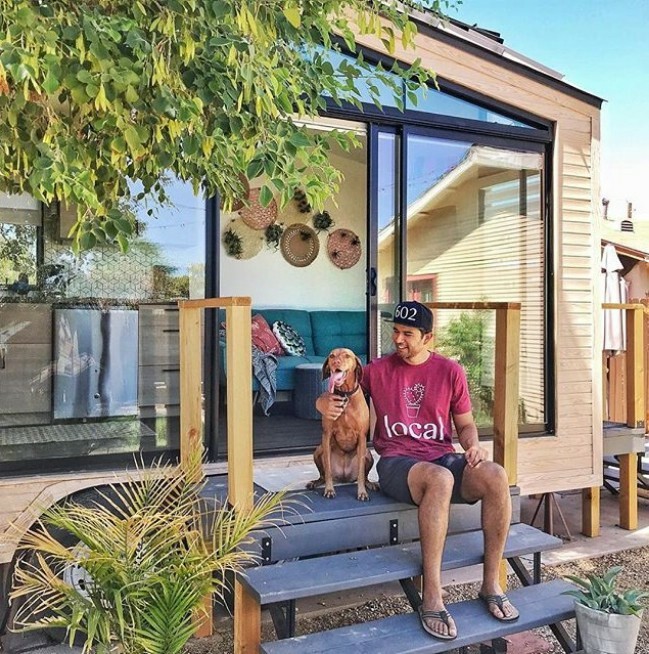 When I saw the Nest, I immediately thought of this Dutch tiny house that we featured a couple years ago. 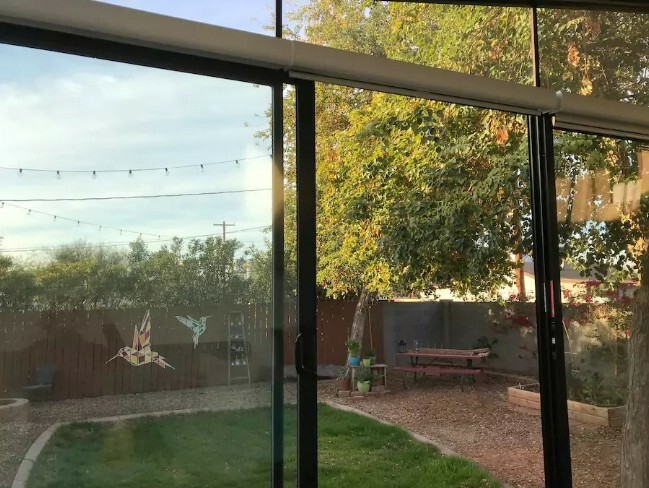 The two homes are very similar in terms of layout and design, especially in terms of the huge window which comprises about half of the front wall. The Nest however has a distinctly homier vibe with a more traditional feel to it, even with the contemporary layout of the architecture. 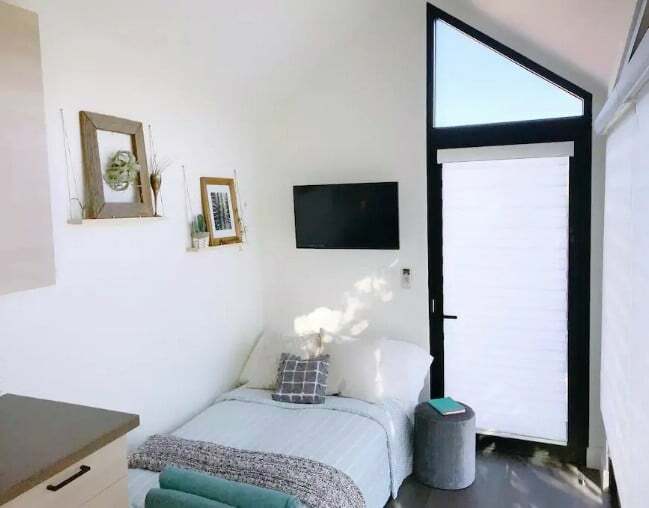 For the most part, the interior of the tiny accommodation has been kept open and minimalist as well, though the decor adds a softer touch. This night time photo really shows off the huge windows and the light spilling through them. 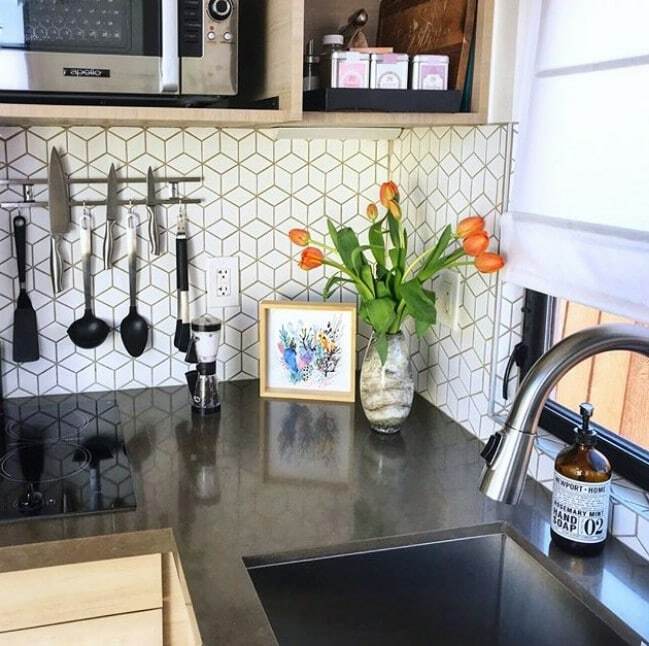 The kitchen features decor which is maybe a halfway point between the traditional and contemporary elements which abound throughout the tiny house. A microwave and other conveniences offer guests what they need to prepare their own meals. Along with the kitchen, other amenities for guests include a dryer, a TV, WiFi, and free parking. 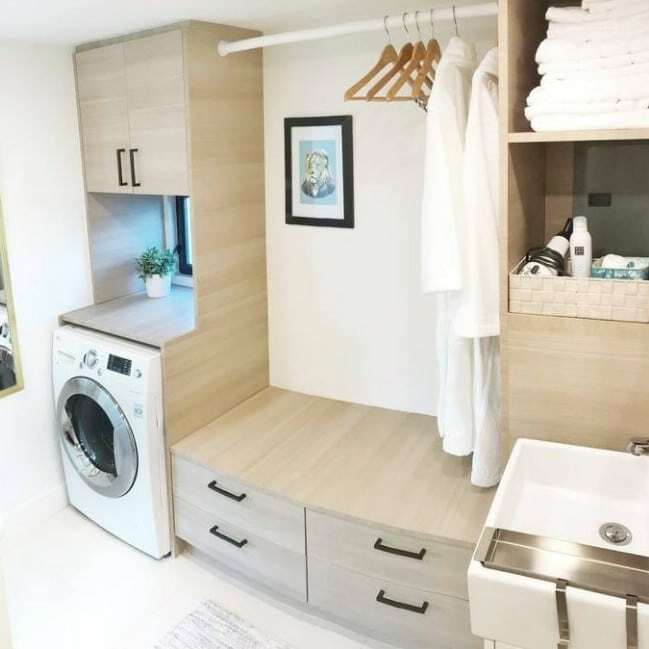 Next the dryer, there is a wide-open space with a closet bar overhead for hanging clothing. Beside that is a set of shelves ideal for towels and more. Beneath the “closet” space, there is a set of large drawers. 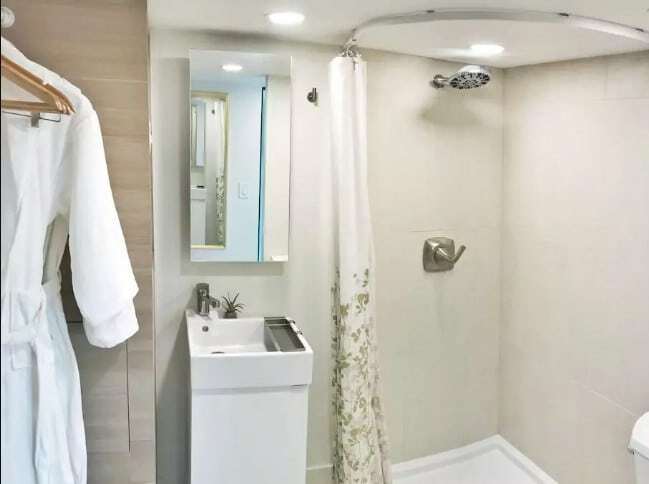 Given the small profile the house and the large windows, it is surprising that a full-size shower can fit into the interior, yet remarkably it does. 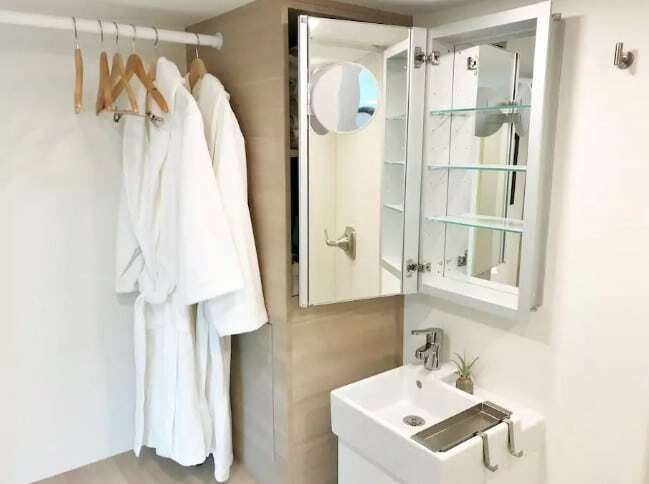 The mirror opens up to reveal more storage in the bathroom. In this photo, you can see the layout of the interior more clearly. The ladder adjacent to the kitchen blends into the wall, almost looking like a set of shelves. This leads up to the loft. The railing enclosing the loft doubles as a set of kitchen cabinets. This is a very efficient use of space. 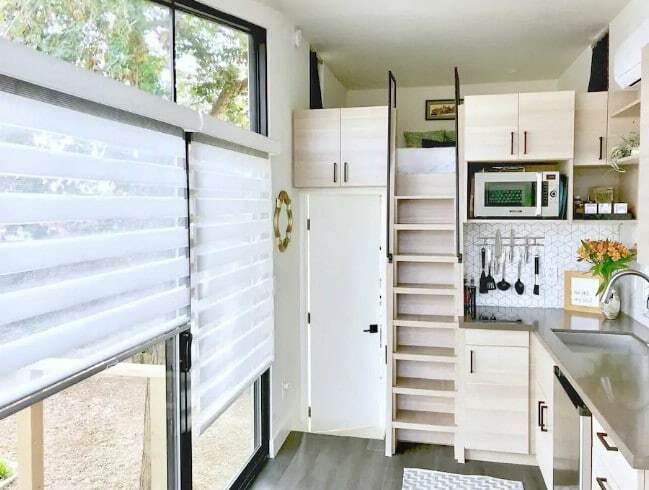 Here you can get a view of the kitchen and the ladder (which in a way is more like a vertical series of steps) through the open front door. 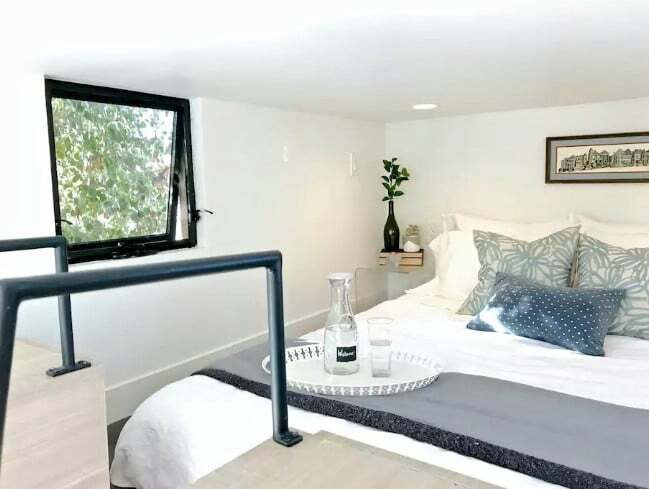 The loft is small but comfortable, featuring a queen size bed with a memory foam mattress for a luxurious night’s sleep. 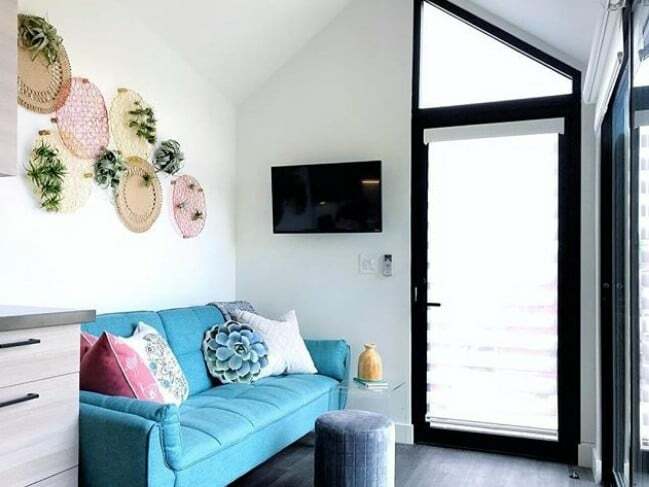 It is easy to prop open the window in the loft to bring in some fresh air. This photo shows the interior right around sunset. 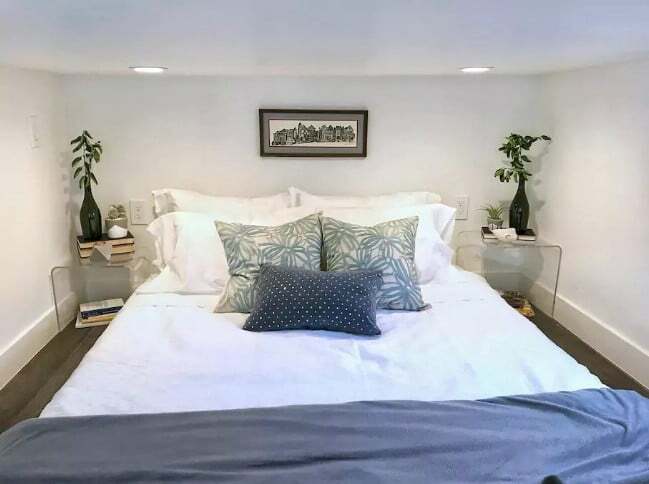 As the light wanes outside, the ambient lights in the bedroom provide a homey glow. The sofa in the living area can be converted into a small bed. This overhead view does a great job of showing off both the layout of the home and the unusual shape of the structure. This is the view which you can currently see out the windows. The fence features a hand-painted mural of hummingbirds. The blog on the official website for the Nest features some really interesting insights into the design process for the house. 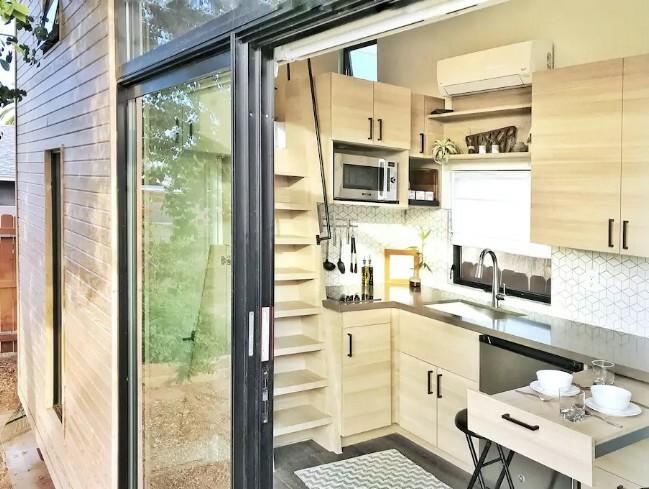 As an example, in the image above, you can see a number of different shapes which the architects considered before they finally settled on the shape that you see for the finished tiny house. While quite a few of these look like they would’ve been pretty cool, the shape that they went with was definitely a good pick. 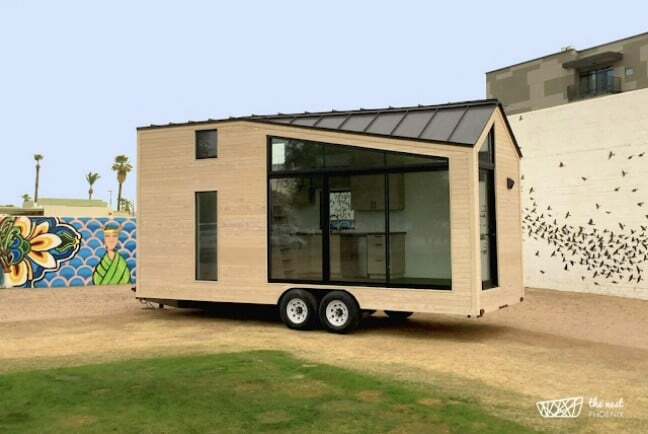 While the Nest currently stands on its own, the team behind it is thinking about making a whole set of tiny houses. Each of them would be similar, sharing architectural elements in common, but each would have its own distinct identity as well. If you would like to learn more about The Nest Phoenix, you can visit the homepage here. You can also book a reservation directly through AirBnB. Currently you can stay for just $75 a night. 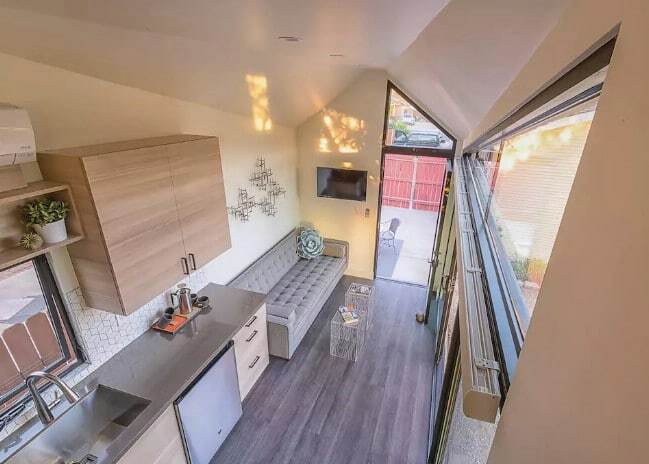 That is a super low price to stay in a gorgeous tiny house. 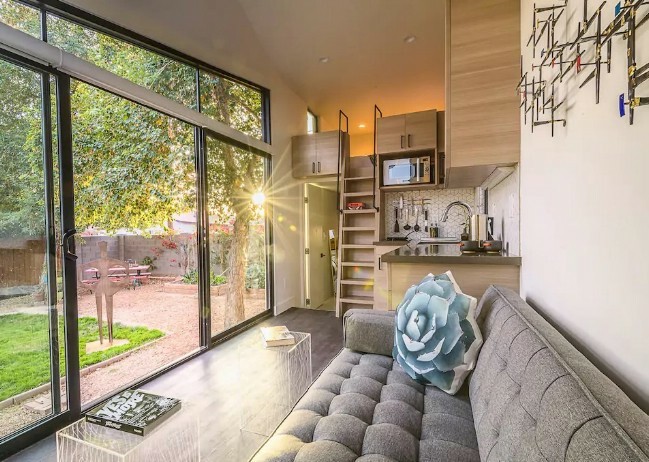 This definitely has to be one of the most unique places you can spend the night in Phoenix!